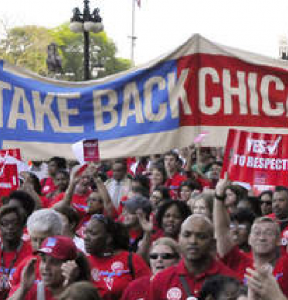 CTU blasts former U.S. education secretary for arguing Los Angeles teachers’ should back off demands in face of ‘lack of resources’ in state with fifth largest economy in the world. 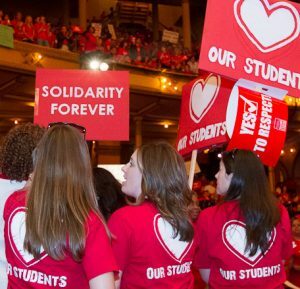 CHICAGO, January 15, 2019—Chicago Teachers Union President Jesse Sharkey issued the following statement today in response to public pronouncements – including in The Hill – by former U.S. Education Secretary Arne Duncan on Los Angeles educators, who began a strike on Monday. “LA teachers know what their students need: smaller class sizes, more staff for special education and bilingual education, and the resources and wrap-around supports that allow low-income students of color to thrive as life-long learners and productive adults. Duncan has instead promoted the opposite, by starving neighborhood public schools, promoting privatization and austerity, and purging Black educators from our classrooms. Public education is a right. Duncan has treated it like an afterthought, and has zero credibility with the parents, educators and community residents who care about equity for ALL public students. “When he’s shilling for management, nowhere does Duncan mention the toxic impact of right wing tax policy on Los Angeles’ Black and Latinx students. He conveniently fails to mention Eli Broad or the Broad Foundation and their scheme to orchestrate the mass privatization of Los Angeles public schools. Instead, Duncan says the union should ‘cooperate’ more with the very management that is seeking to undercut public schools through mass charter expansion. That mirrors his statement almost a decade ago that the devastation of Hurricane Katrina was the ‘best thing’ to happen to New Orleans’ public schools, because it opened the ground for mass charter privatization. As in Chicago under Duncan and his successors, privatization in New Orleans has slashed the number of Black teachers, and more than ten years on, New Orleans’ Black working class parents, students and residents charge that the experiment has failed them. Duncan’s policies profit private operators – and undermine parent voice, public accountability and the educational needs of students. “Just as Duncan regularly shortchanged CPS by refusing to identify and raise progressive sources of revenue that our schools need, he massively expanded selective enrollment schools for well-off white students. He continued those policies as education czar, to the detriment of school districts across the nation. “The educational policies he put in motion in Chicago and pushed in Washington have helped drive out thousands of Black families from Chicago, families who struggled to find stable schools for their children at the same time they confronted racist, classist city policies in housing, policing and economic development. 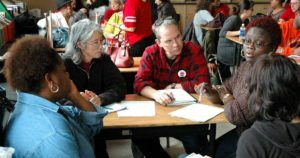 As a principal architect of Chicago’s disastrous school closure experiment, Duncan was CEO during the first wave of massive charter expansion in Chicago – forcing neighborhood public schools that had been under-resourced for decades into brutal educational hunger games that have left neighborhood schools starved for resources. As US Education Secretary, he promoted the misnamed ‘Race to the Top’, publicly blaming teachers for the dire consequences of racist school funding practices and endless austerity. He’s dismissed class size as an issue – an excuse to purge thousands of Black public educators in Chicago, at a time when a growing body of research shows that our schoolchildren need more, not fewer, educators of color.